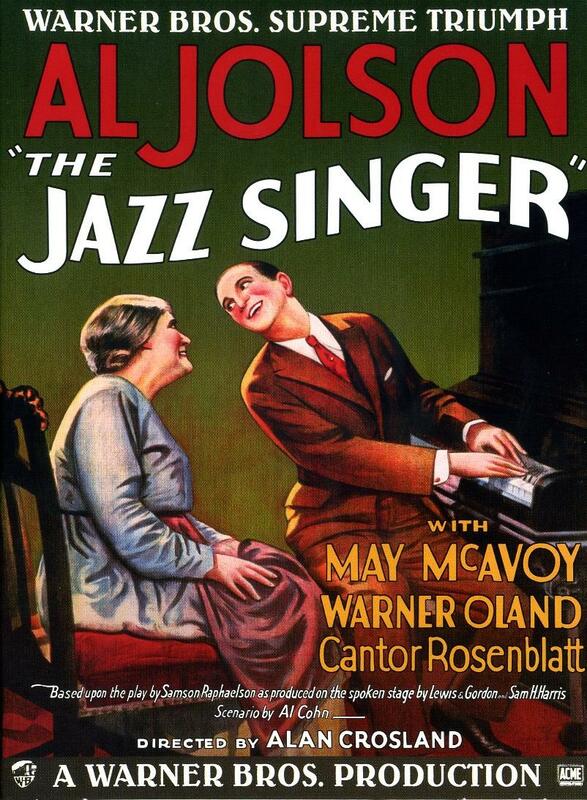 We begin with 1927’s “The Jazz Singer”, a fitting beginning to our tour of cinematic history. Known as being the first feature length film to feature both a synchronized musical score and some synchronized speaking, “The Jazz Singer”’s historical significance is its position at the end of the silent film era and at the beginning of “talkies”. History aside, is it still good? Diane and I agreed: it was an interesting movie. The music is beautiful. The songs, however risque they may have been for the time, have an old timey charm that still resonates even if the novelty of hearing them in a movie theater does not. One thing that remains fresh about the movie even today was its focus on Jewish culture and Jewish identity in a new world. Neither Diane nor myself have had much exposure to Judaism, so seeing a Jewish family be at the front and center of a movie as culturally significant as “The Jazz Singer” was kind of uplifting. Judaism and Jews in cinema are not unheard of – I personally loved The Coen Brothers movie “A Serious Man” – but the way the movie presents Jewishness didn’t seem to bother with how the audience might see it. There were no explanations or exposition trying to expound upon Jewish culture for non-Jewish moviegoers. There also was not any attempt to obfuscate it either. This was a movie about a Jewish man and a Jewish family wrestling with identity and it executed that story very well. However, as far as stories go, we both agreed that “The Jazz Singer” is about as cliche as you can get. Without more context, I am unsure of how often this trope was used even back in 1927, but the whole “child doesn’t want to follow in a parent’s footsteps and is exiled for it” plot made the movie feel paper thin. Devoid of its technical achievements and beyond its historical significance, no one should watch this movie for the plot but at least the acting and music largely makeup for it. I did have one major concern of my own: the mother and son relationship. For one, it was creepy. I imagine it was okay at the time to kiss your mother on the lips, buy her diamond jewelry, and want to whisk her away to Coney Island where you promise to kiss her some more. It didn’t help that the lead actor with his silent film, over-the-top white makeup, looked like an even creepier Ted Cruz. Finally, we arrive at the real elephant in the room: the blackface. I have heard of this movie before, but neither of us were aware going in that we would so quickly see some good ole fashion racism. The scenes with the lead in blackface singing about his ‘mami’ made Diane uncomfortable, but I thought they were hilarious. We did both laugh when, in full blackface, the lead actor opined about troubles facing his race (meaning the Jews). All in all, we both feel better having seen “The Jazz Singer”. It was our first real exposure to a silent film and it is plain to see how important this film was at the time and how important it still remains. I doubt either of us ever watch it again, but if you are curious about movies and their history, then “The Jazz Singer” shouldn’t be missed. I saw the Jazz Singer a few years ago at the British Film Institute and did so on the understanding I was seeing a piece of cinematic history, rather than viewing out of a specific desire to see this film on its own merits. Prior to the screening there was a brief chat from a film Historian who made some succinct points about taking the film within the socio-political context of its time and not to view it through the exclusive prism of contemporary identity politics. Your observations on the film are broadly similar to mine. The songs are still classic and very telling of the culture of the age. It is, as you say, a fascinating window into US Jewish society of that era and it doesn’t try to sell itself or explain it’s foibles. It just presents itself as is. I wish more films today did this, rather than indulge in PR for their subject. I look forward to reading about what you and Diane are wtching next, and aplaud your interest in broadening your cinematic experience. It’s an exciting list, especially since my movie watching career began largely in the late 90’s. I’ve tried to fill in the gaps, but I’ve only recently become more and more appreciative as movies as an art rather than mere entertainment. Diane is in largely the same boat, so while it won’t be a particular balanced series, it should be interesting to see what two technically-millennials (’87 and ’88) think about practically all of movie history.